Adapted from Villa Duchesne Oak Hill: A Glimpse of the Past, A Glance at the Present written by Jeanne Burke O’Fallon City House and Academy of the Sacred Heart in St. Charles '69. May this effort further the building of this house of the Lord. In 1927, Reverend Mother Mary Reid, Superior Vicar, made plans for a new Sacred Heart boarding and country day school in St. Louis county. She learned that Mr. and Mrs. Bert Lang were anxious to sell their large strip of wooded land with its rustic log cabin, for Mrs. Lang, an invalid, keenly felt the isolation of the country. 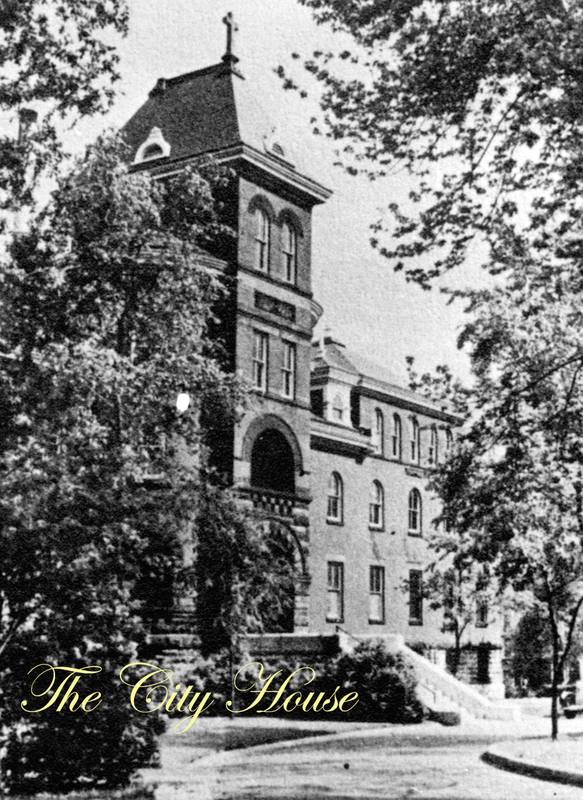 On April 13, 1927, the Society of the Sacred Heart purchased the 38 acres. A few months later, Mr. and Mrs. O.S Jaccard sold the Society their adjacent 20 acres. On August 21, 1928, by “providential coincidence,” the 110th anniversary of Mother Duchesne’s arrival in St. Louis, the Blessed Sacrament was brought to a tiny oratory in the log cabin and the first community of religious took up residence. City House-Barat Hall loaned Reverend Mother Lily Garesche to oversee construction. Assisting her were Mother Mathilde Mouton, who was to become the first mistress general, and Mother Genevieve Johnston, who would become the first treasurer. The architectural firm of O’Meara & Hills was contracted to build a French chateau of Missouri limestone with twin Norman towers the predominating feature. Twenty pages of blueprints show plans for 206 rooms with wide, vaulted corridors forming the house in an “H” pattern. Although elaborate by today’s standards, in “a simple ceremony” on October 23, 1928, Archbishop John Glennon laid the cornerstone. Some of its contents included a block of wood from Mother Duchesne’s pear tree at St. Charles and a brick from the building she knew there, statues and medals of Our Lady and St. Joseph, a medal commemorating the canonization in 1925 of St. Madeleine Sophie to whom the school is dedicated, and the names of all the superiors general of the Society of the Sacred Heart. When the cornerstone was laid, Reverend Mother Reid was in Rome and returned to St. Louis with word that Our Mother General, Very Reverend Mother Marie De Loe, wished the new school to be ready for the fall term in 1929—less than a year away. This seemed an impossibility as trials of every kind—strikes, intense cold and heat, torrential rains, and even the death of one of the contractors—slowed the effort. Through “the power of prayer and the courage and confidence of Reverend Mother Reid,” Villa Duchesne was scheduled for opening on October 1, 1929. An additional 20 students arrived on October 21 after parents convinced the religious of the need for a Catholic kindergarten in the area. The log cabin served well as their classroom. Despite the efforts of local alumnae who, in their characteristic generosity and service, helped sweep, shine, and unpack, and loaned needed items from their own homes, first students recall workmen interrupting classes to finish their jobs. Some boarders even slept on mattresses on the floor until bed frames arrived. A favorite story, which cannot be proven, is of the religious making, in an idiom of the Society, “the night visit”—two nuns going around to secure all doors and windows. So ingrained was ritual and obedience that the visit was faithfully made despite a lack of glass in some windows and locks on some doors. Even if finishing touches were lacking, the predominant reaction to this new school was admiration for its beauty, both natural and architectural. Nearly every early description of Villa Duchesne in the archives today combines the words “beauty” and “simplicity” or “beauty” and “simple dignity.” This is fitting for there has always been within the Society of the Sacred Heart a dynamic equilibrium of opposites: to offer and value all that is beautiful and to shun excess; to nourish the spirit with all that is lovely and to free it of all that is frivolous; to fill hearts and minds with that ordered simplicity which is beauty and to have that fullness overflow into the lives of others. First students assembled at Villa Duchesne from 20 different schools. Much effort and prayer went into molding this varied group into one cohesive family and to establishing an atmosphere that would allow Villa Duchesne the privilege of calling itself a Sacred Heart school. These formative years offered additional challenges. When the school was 29 days old, on the 29th of October 1929, the stock market crashed and the Great Depression followed. Still, the School Journal, carefully recorded by the mistress general, shows soon enough that the school exhibited high academic standards and achievements and a development and appreciation of traditions. From the very first, great athletic enthusiasm and success, a variety of fun and worthwhile activities, and an ever-developing spirit were hallmarks of life at Villa. The alumnae, a cohesive, effective group from the start, responded to any needs and were full of ideas. Parents were interested and eager to serve. By the mid to late 1940’s, there was no question that Villa Duchesne was a first-rate school in the St. Louis area and among Sacred Heart schools in the country. The Second World War changed some routines and curtailed some festivities at Villa Duchesne, but the war also demonstrated and strengthened the generosity and other-centeredness of our students and alumnae. Many were active in Red Cross efforts, in relief drives, and in raising money for the Sacred Heart schools in Europe. By the 1950’s, the school was so well established, so comfortable in the traditions of a Sacred Heart school, and so shining in its spirit that outsiders could not have guessed that the school had barely reached adulthood. 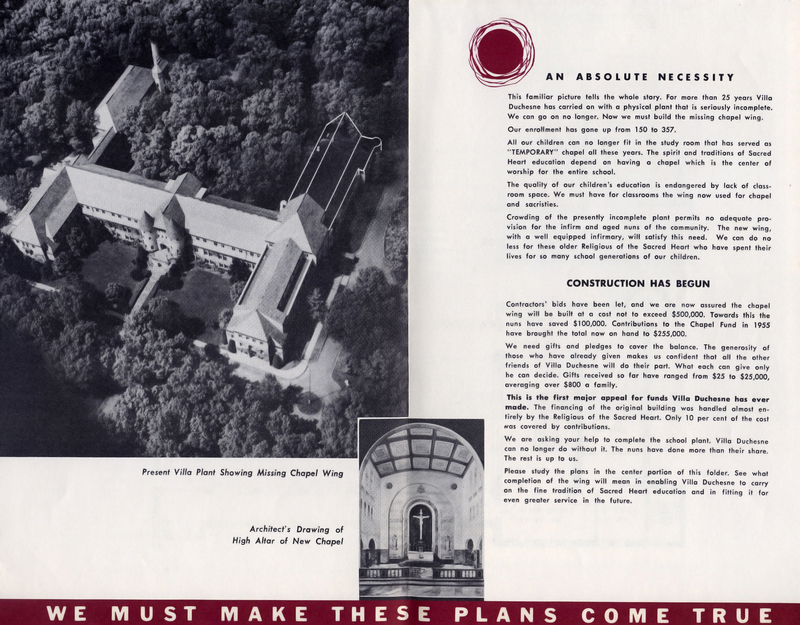 In the mid-1950’s, with the original debt paid, and with enrollment at a point where it had to be limited, plans were initiated for the long-dreamed-of-chapel. From an oratory in the log cabin to a small room later used as the media center to an area above the present auditorium, the chapel, designed by Marguolo & Quick, would grace the location originally planned for it in 1929. A flat roof on the east side of the building was awaiting the structure. This father took a tablet from a nearby table; then and there he made up pledge cards, passed them around, and sat down to write his check. Others quickly followed suit. This immediate, generous response from parents as well as from alumnae, friends, and even students, allowed Villa Duchesne to have within a year and a half a magnificent chapel where finally all the students could worship together. The names of the donors are on a scroll in the main altar. The proud workmen asked that their names also be included. The beloved Reverend Mother Angela McCabe, then superior vicar of the southern convents and a member of the first community of Villa, told her community that as she knelt in her place before the students’ first Mass in the chapel on November 9, 1957 and watched the long lines of students in their white dress uniforms file in, and as she gazed at the altar flooded with light, centering with golden radiance on the great marble crucifix, joy such as she had not experienced since the day of her profession as a religious 34 years before filled her heart to overflowing. After such swift success in the building campaign for the chapel, construction soon began on Hellmuth, Obata & Kassabaum’s design for a student activities building, complete with a swimming pool as well as a gymnasium. This was dedicated by Archbishop Joseph Ritter on October 22, 1961. It was later named the Thelma Kenefick Activities Building in recognition of the remarkable Kenny’s 34 years as athletic director. Who could have predicted the changes that would come after the Second Vatican Council that began on October 11, 1962? The world was changing; the Church was changing; and so, inexorably and often painfully—sometimes in ways that were welcomed and sometimes in ways that were feared and regretted—Villa Duchesne was changing. A look through shelves of yearbooks shows ordered stability giving way to greater spontaneity that peaks with a 1970 issue proclaiming on an opening page: “The Times, They Are A Changin’.” In a span of just three years, the City House in St. Louis merged with Villa, the pods of Oak Hill were built, the boarding school closed, boys were once again admitted to the lower school, and the first lay person, Robert Wray, became head of the school. And the Lord continued to build this house. Now with the perspective of several decades, we see this period of rapid change as a time of beginnings much more than endings, of gains, surely, more than losses. The closing of City House and Barat Hall gave new life to our student body, faculty, alumnae, and even to the physical campus. The influx of 226 students and the sale of the property at Maryland and Taylor Avenues brought about the construction of the lower school’s pods. Designed by Curtis Ittner, these simple bi-level classroom buildings were intended to complement and blend with the natural beauty of the outdoors and to allow freedom, flexibility, and warmth indoors. The amalgamation of students was smoother than many thought possible. Sister schools became, simply, sisters. Faculty members were accepted without question and put to work. Many who are now considered real symbols of Villa Duchesne and Oak Hill are, in fact, City House-Barat Hall transplants. Villa Duchesne alumnae, gracious and giving, welcomed the alumnae of City House. Soon the 1,200 City House alumnae, always outspoken in loyalty to their alma mater, came to see that their loyalty was not tied to one special place but to something much broader and more lasting. Today, the combined Villa Duchesne-City House Alumnae Association is a strong, positive power in the St. Louis area and in the Associated Alumnae of the Sacred Heart. Although Barat Hall did not continue, boys did return to Villa Duchesne in 1971-1972. Villa has enjoyed watching its graduates from these first classes become a force for good in the city and continue the tradition of alumnae loyalty and support begun by the boys of Barat Hall. A male business manager and headmaster marked the transition at the beginning of the 1970’s to a Sacred Heart school run by lay people as well as religious. Today lay people eagerly take on more and more responsibility at Villa Duchesne and Oak Hill. They are vivified by the spirit and vision of St. Madeleine Sophie and St. Philippine Duchesne. Currently, Villa Duchesne is guided by a dedicated board of trustees, an outgrowth of an earlier lay advisory board. This group is a more formal, defined version of the wise and loyal business people who have always befriended the Society of the Sacred Heart. The trustees are assisted by the alumnae, Mothers’ Club, and Fathers’ Club who can never do enough for the school. But what of the real point, the essence of our school? What of the hundreds of students of Villa Duchesne and Oak Hill today? For all the uniqueness of today’s students, they are remarkably similar to our first students and to those of the previous decades. Students come to Villa Duchesne and Oak Hill enchanted by its beauty and soon find much more. As they are challenged by academics, they learn to think and write critically, clearly, and creatively; they learn to question, to evaluate. Their successes are rewarded both formally and informally while weaknesses are given individual attention. Beyond the classroom, today’s students at Villa Duchesne and Oak Hill may be part of a Midwest championship hockey team, a state champion show choir, or a truly professional thespian group. Our students win top honors in highly respected fine arts contests, speech meets, science fairs, literary contests, yearbook workshops, and track meets. To quote from another graduation speaker, our students “more than most know that hearts are sacred.” Our students know they have power, and they know that they must use that power to create a just and peace-filled world. Woven into the tapestry of the past are many religious and liturgical practices and traditions. Still, our current high school students can stand before the whole student body and talk of the power of God in their lives. There are no “practices” or white uniforms for feast days, but there remains a golden glow on these cherished days. Students look forward to the certain feast day goûterand hope for a surprise congé. A particularly special feast to the students is that of Mater Admirabilis. Mater Admirabilis remains at the center of the school. Students today respond to this “treasure of calm and serenity,” this “virgin of the invisible and the essential” in a way that sometimes confounds and always consoles. Our students, as well as religious and lay teachers, love to be at this special place. As we see our little ones dismissed for the summer and quickly returning for summer camp, and our older ones always around and dropping by so often after graduation, we have to believe that Villa Duchesne and Oak Hill is truly home to them. Since 1929, we have not labored in vain. Since 1929, the Lord has built this house.